PBS TV (June 2016) — Tune in to your local PBS affiliate this summer as Vicki Payne, host of "For Your Home," partners with Diamond Cabinets for the renovation of a home in a trendy Charlotte neighborhood for her new "Bungalow Blowout" mini-series. For the 31st season of For Your Home, Vicki renovates a charming 1920s arts and crafts bungalow in the urban Elizabeth neighborhood to better accommodate a growing family. With a new baby on the way, the family needed to update their small home to stay in the neighborhood they love. Diamond Cabinets jumped on to design the new kitchen, laundry room and bathrooms for the bungalow renovation. In episode six, MasterBrand Designer Shauna Leuken walks Vicki through tips in cabinetry design, and the Diamond semi-custom cabinetry used in the kitchen. 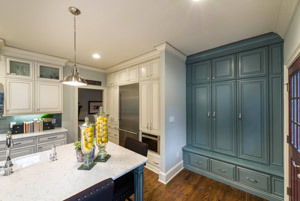 Diamond Cabinets' organizational solutions such as a Utility Drop Zone Cabinet, roll trays and cutlery dividers make the space especially functional for the family. In episode seven, each room in the final home is revealed and ready for the family to move into. Diamond Cabinets is committed to providing reliable and beautiful cabinets and innovative storage solutions. The timeless style and expert craftsmanship in the Bungalow Blowout renovation project are just what Vicki needed to refresh this classic home. Vicki Payne is a nationally recognized designer, home improvement, gardening and decorating expert. Each week, millions of viewers both nationally and internationally have tuned in to watch her popular television show, For Your Home. The show is available on PBS, Create TV, and in national and international syndication. For Your Home is the longest-running home and garden show on television. This informative and entertaining program takes the mystery out of home projects. Vicki’s step-by-step demonstrations are helpful to homeowners at all levels of experience and engrossing to viewers who are simply curious about improving their homes.